Offices with limited space but has printing, scanning, copying, and faxing needs may opt for the compact Samsung SCX-8128NA. Aside from saving floor space, this device is sure to deliver high-quality output. The reliable Samsung SCX-8128NA has decent performance speed and offers standard networking connectivity. It can handle media as large as A3 and print on labels, glossy paper, envelopes, card stocks, and more. Wi-Fi connectivity is not offered. 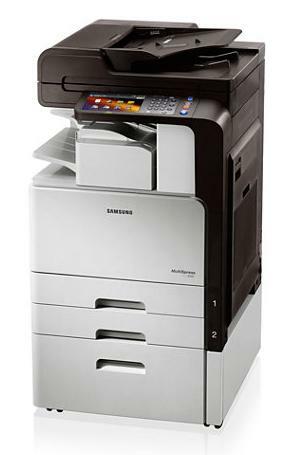 The Samsung SCX-8128NA offers optional items such as finishers, job separators, staples, and more. This model comes with standard 7 inch touchscreen display with colour graphics. It is also integrated with 768 MB of memory. For connectivity, USB and Ethernet ports are offered. The Samsung SCX-8128NA has a Super G3 fax machine with a modem speed of 33.6 kbps plus a colour scanner with maximum resolution of 4,800 x 4,800 dpi. Printed output can be up to 28 pages per minute with the first page out in eight seconds and the Samsung SCX-8128NA has a standard input capacity of 150 sheets. Users will have no trouble operating the Samsung SCX-8128NA, thanks to the intuitive menu. Sharing the multifunction printer is also easy as it is compatible with most operating systems. The Samsung SCX-8128NA also has standard duplexer for automatic double-sided printing and USB host for direct printing and scanning. This reliable unit delivers consistent professional output. Printing from tablets and mobile phones can be possible if the Samsung SCX-8128NA had Wi-Fi connectivity. Finishers are additional costs.